I met Sandee Kastrul (top seated row, third from right) at Cusp Conference 2013. (1) One of the ground rules specified by this event’s organizers, Multiple, was to proactively introduce yourself. After making smile contact, I had the privilege of finding out about her finding and building of i.c.stars. Here, she gives her story on finding her non-profit company, which is highly focused on “providing a rigorous technology-based workforce development and leadership training program for low-income adults” in addition to her points of view on business, creativity, and more. At the intersection of technology and community, down the road of hard work and passion, lies Chicago-based non-profit i.c.stars. 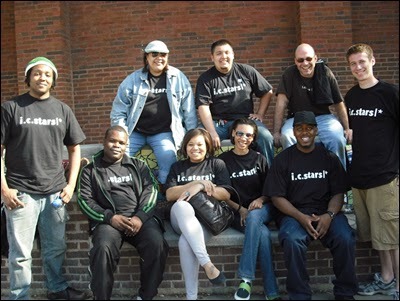 i.c.stars is a workforce development organization and social enterprise, that works tirelessly to find talent, train that talent, and put that talent to work. Not only do we foster and develop talent in change-driven individuals so that they will excel in technology careers, we are committed to the concept that they can and will affect long-term change as community leaders. It’s interesting that we’ve found that so many qualities required for success in technology careers are closely related to those associated with community leadership. They share a common DNA that comes exclusively from a history of overcoming adversity. Adversity engenders resiliency in the face of challenge and the ability to solve complex problems. These two qualities are unlocked by the i.c.stars program, and harnessed to help our students flourish professionally and personally. i.c.stars has the ability to enroll 60 people per year, after screening 400 candidates per quarter and selecting 15 to participate in each of those quarters. The two-year i.c.stars program consists of a four-month internship program, followed by a one-year residency program and then a one-year fellowship. 60 to 70 hours are required, so after the candidates are selected, hard work lies ahead. It’s well worth it, though. Upon completion of i.c.stars’ program, these individuals have a combined 6,000 hours of work experience, an associate’s degree, community service hours and solid relationships to build upon. We launched in 2000, and now we’re on our 29th training cycle. We have more than 300 alumni, and our placement rate is in the 90th percentile, with the average earning increase after program completion coming in at 300 percent. What sparked the idea to co-found i.c.stars? I’ve spent a lot of my career teaching and educating others. Back when I was teaching high school chemistry, I had a wide variety of students at many levels. I formed personal relationships with many of them, and one day, a brilliant former student, with a beautiful scientific mind, came to see me. He revealed that he wasn’t harnessing his scientific ability to its fullest potential because he was spending his time in a downtown hotel—at a cleaning job. This young man inspired me to think about how to serve people like him who had such amazing potential and a particularly innate desire to lead, to understand leadership, and to make opportunities for others. Two heads—and hearts—are better than one. How did you connect with your co-founder, Leslie Beller? And what made working together work? Leslie (a consummate marketing genius) and I were already best friends and colleagues. Others often referred us as the “lights on girls,” because we always stayed late at work to brainstorm and explore ideas. We worked well together because we both believed that opportunities were endless in technology, no matter what you liked. The barriers to entry at the time were fairly low. In addition, what we loved then, and still love today, is the systems thinking, process, and methodology embedded in technology. We wanted to take our passion for technology and marry it with this leadership concept to create opportunities for others. What was the first thing you did to start making i.c.stars a reality? This is a great question, because so many different pieces came together to get us up and running. The answer could be filing our letters of incorporation, or the “road show” we did to garner support in the local startup community. I could also argue that things really started to get real when we were building out our first community curriculum. Or when we had some great partners invest in us; our first investors were the Trader’s Foundation, and we started operating in space donated by Closerlook. Ultimately, I think we really got started on the day we were able to finalize and make a welcome “home” for all of the brilliant folks out there who were thinking and acting differently, who wanted to engage in something bigger than themselves, and be part of shaping the next generation of community and technology. i.c.stars’ tremendous journey began in 1998. What essential activities/steps were taken to establish i.c.stars? And why were these activities/steps important? That’s very true—it’s been quite a journey. Starting in 1998, ahead of the dot-com bust was certainly a challenge. But we learned many important things about the market, and sustainable business from the business and community leaders who visited us daily to have “high tea” (above). They also helped us to see the dot-com implosion on the horizon. We were also fortunate to align with an organization called SIM, the Society for Information Managers. This group of CIOs adopted i.c.stars, and to this day, through mentorship, sponsorship, and thought leadership, create employment opportunities for our graduates and sustainability for the organization. Who and/or what keeps you going at i.c.stars? Our interns and alumni keep me going. I believe I am nothing more than an overpaid custodian to their legacy! I’m inspired to keep the lights on, and to always provide a place for folks to call home. Keeping things going for all of the people out there who think and speak differently, and who are solution-oriented, drives me. How would you describe the work culture at i.c.stars? We definitely have a unique culture at i.c.stars! We’re fun-loving people, but it’s intense here, and we have ridiculously high expectations for everyone. This starts in the program’s paradigm in education. I’ve never seen people work so hard to make opportunities for the organization and to help raise the bar. As in any organization, different types of people make up the i.c.stars environment. I like to use a science metaphor to describe our culture. We have protons, neutrons, and electrons in every group. The protons are the positive ones, the neutrons are both positive and negative, while also being analytical. Then, of course, there are electrons, who are able to see the negative space. Electrons are the folks who keep us honest and ask the best questions, which encourages change. One of the most important aspects of our culture is a sense of reciprocity. In technology, social service and leadership, we measure winning by how much we give. As problem-solvers, we are the ultimate gift givers. We’re solving problems for society, business and for community, and no matter what it is, it’s crucial to understand how to give a gift. How big is your team? And what size company do you prefer? i.c.stars currently has a staff of 10 and nearly as many contractors. In our social enterprise, we employ more than 20 different residents. We continue to grow and expand, and it’s exciting to watch that happen. The vision at i.c.stars has always been to reach 1,000 community leaders by 2020. This includes business leaders, those of us who are starting nonprofits, consulting businesses and incubators, like Jerome Dishman and BLUE1647 that promote other entrepreneurs. This includes policy leaders and alums who look at things from a systems level and are working to change policies that oppress us. When policy, business and service leaders come together, we can begin to develop solutions that have the potential to affect an entire region. We’re looking at expanding our operations to Detroit, Denver, and Milwaukee, in the next two years, and placing a greater emphasis on supporting and promoting innovation across the country—and learning from each other. We’d like to hold listening campaigns in every city to determine the root causes of their issues and assess the local demand for technology talent. When it comes to businesses we partner with, we are a special organization. We want to establish partnerships with replicating entities that adhere to our goals, standards and guidelines, in exchange for permission to use the i.c.stars brand. with your company’s name. What is the meaning of i.c.stars? That is all my co-founder Leslie’s brilliance! Leslie has great marketing skills. She creates experiences for the community, so yes, there is a definite connection there. Our legal name is Inner-City Computer Stars, but the reason why it’s such a great abbreviation is that this is about us daring to dream, imagine, and, well... shoot for the stars! It’s unfortunate, but we’re in an industry with a disproportionate ratio of men to women. Rather than sustaining others and setting the table for them, it’s time for us to nourish ourselves. We can be part of the solution. We have to give ourselves permission to build our vision. Change can be difficult to manage. It’s uncomfortable, but that’s how we know what we’re doing is working. The hardest thing about i.c.stars is that it means something different to everyone. For our sponsors, i.c.stars is a great organization to use to plug their businesses, and it gives them the opportunity to improve their relationships with buyers. For our interns, it’s a unique transformational experience that helps them develop their careers alongside community leadership potential. It can be challenging to keep the ideas of leadership and technology working together and to continue to share that message with others. If you just view i.c.stars as a technology training company, you’re missing the anchoring principle of this organization, which is that leadership makes opportunities for others. We could just teach technology—many reputable institutions do that—but we wanted our vision to include growing community leaders who could affect the lives of others. It’s very focused on transparency. All of the doors in our space are made of glass, with the exception of the restroom door. In addition, not all of our walls meet the ceiling. 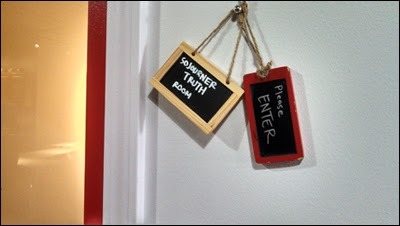 We also have a room in our office that we call the “truth room”—named after Sojourner Truth (above). This is the only room aside from the restroom that has walls that go up to the ceiling. This allows for privacy, direct conversation and conflict, which is what truth really is. grow them, collaborate and get things done? The first key to working out disagreements is hiring people who are smarter than you. Then, it’s about diversity. For example, our Vice President Eric Lannert wears many hats. So much that some people call him the CFO and others call him the CIO. But regardless, he and I come from very different worlds. He grew a career in consulting at Accenture, and I come from an education and arts background. What we have in common is that we are both designing learning solutions—we’re just using different tools. When we came together to teach, we had really different perspectives, but I fell in love with the way he thought. I began to understand and anticipate how he was going to think through solutions or process. This process of stepping into the other’s shoes through love and appreciation of different approaches allowed us to develop 360 degree solutions. Although it seems counter-intuitive, our polarized ideas made it possible. Another interesting thing we do is a workshop called “Buffalo Soldiers.” In this exercise, we identify our personal and professional soldiers. The professional soldiers protect our personal ones from getting hurt, so that when a conflict does arise, we can figure out who stands in line and protects us—so that we’re not standing still and can take action. This helps us to move forward in our careers. On the flip side, most of the time we do get hit or hurt or feel like we can’t overcome a challenge, so our personal soldiers take the hits and become vulnerable. We must then protect them with those gifts that we possess that make us great workers and extraordinary thought leaders. Every year I go to CUSP, a conference about “the design of everything.” It’s my only indulgence—but it’s an incredibly inspiring one. Gift giving and reciprocity are concepts that really inspire me. I love them. What’s more, I’m inspired by gifts that other people give, and not necessarily to me. In those moments when somebody acknowledges that they see you for who you are, for what your superpowers are, or for what you may be struggling with—it’s as if they give you an object made of thought, or a mirror that shows you aren’t alone. Sometimes, it’s the little gifts that make such a difference. A few years ago, one of our cycles had just began and this was a particularly “prankster” cycle. Often, all of our forks were stolen and a little post-it was left with where the forks were supposed to be that said, “Fork you.” We were and are a joking culture, so we appreciated the laughs, but ever since then we are always low on forks at i.c. stars. No matter how many we buy, they disappear! When we make a withdrawal like that, it stays with us for a long time. I honestly have no idea where the forks go, but it’s worse it when you try to eat salad with chopsticks and so on. 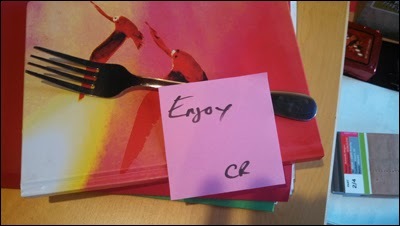 Not too long ago, I came into my office and amidst all the papers, mail and proposals and desk junk was a fork sitting on my desk with a post-it that said, ”Enjoy” (above). At first, I couldn’t see what I was supposed to enjoy, like this was a fork I’d left on my desk when I brought my own lunch or something. Then I realized it was gift from my colleague Cristian who was saying, “I see you’re struggling with those chopsticks.” More than that, I believe that he was undoing the “fork you” moment by making a deposit where that withdrawal had gone. Design that’s limited and doesn’t listen. It’s not as simple as one statement, though. There are “5 D’s” in the process: discovering, defining, designing, community development, and personal development. You also have to know what problem you’re trying to solve before you can get started. That requires real listening. True listening is golden, because you never forget when somebody truly and authentically listens to you, and you feel you’ve been heard. Define the problem you’re solving. Recognize your original impulse and remember what you overcame. Exploit your resiliency and the toolkit you developed in the process as a result. that should be on everyone’s bucket list? i.c.stars. Come here and spend time lying under a tree, looking at something from a different perspective. 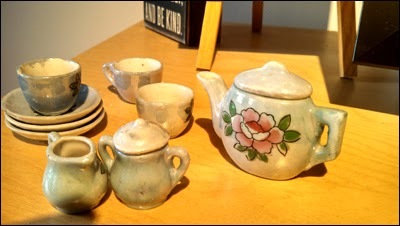 Share a pot of tea, and your journey with us, and we will listen. How does the city of Chicago contribute to your work? Chicago is a very diverse city with so many different communities. I grew up in Rogers Park, one of the most diverse neighborhoods in the country. Growing up there taught me how we’re all different, with unique experiences and conditions that shape the way we see the world. Chicago is rich that way, and I think we really acknowledge and appreciate levels of diversity in our city. It’s also a great place for innovation! Not only do we have great universities and thinkers, but we’re right in the middle of the country, allowing us to be in the middle of things, to “mix it up.” The pioneers are on the coasts—the old school on one and the new school on the other, with Chicago in the middle. Our Midwestern values and our belief that anything is possible is supported by our great city. (1) Read my summary of Cusp Conference 2013 in Chicago. All images courtesy of Sandee Kastrul and Brandie Dunagan of i.c.stars. Typeface of quotations is Futura Condensed of Futura, designed by Paul Renner in 1927.